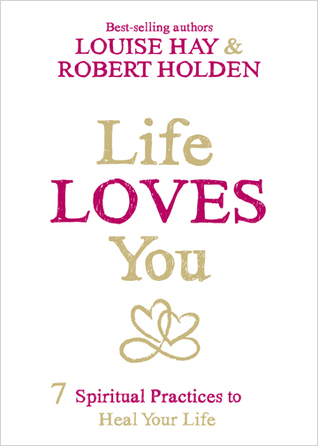 This book is a reflection of a nice conversation between Louise Hayden and Robert Holden. You follow them through time having conversations about life loving you. They go over their childhood memories and their past. They come to a conclusion that they did not love or accept themselves when they were younger. They quote Albert Einstein and Buddha for how we should love and accept ourselves so that Life Loves You or God Loves You. The universe, according to Albert Einstein, is either a friendly or unfriendly place? Which do you decide upon? It’s a choice. Each chapter is followed by an exercise. The first is to do mirror work. Being able to face yourself and say that you love yourself is key. Then the 10 dots of Affirmations, lets you place 10 markers around your house where you affirm something positive in your life every time you see the 10 dots or 10 stickers around your house. An Affirmation Board is like the Vision Board – simply affirming what is important in your life. Daily Gratitude whether first thing in the morning, throughout the day or last thing before you go to sleep is very important. Being receptive to receiving good is very helpful. By creating a receiving journal you open yourself to what the world can provide. Finally, blessings to and of the world, heals the future. This book is enjoyable to read. It reads very easily and reflects upon Louise’s life and how she has progressed. She did not expect or know Hay House would be the sensational success it is today other than she wanted to self-publish – “You Can Heal Your Life.” From there, she simply did what was in front of her. Many of her successes were at a later stage of life but that did not stop her from moving forward. From learning to ball dance to producing art work at a elderly age, Louise does not let life stop her and so we should follow a similar example. She produced the “Blessing Buddha” as a work in progress for five years and it became a hit at Art Beat in Vista, California with many prints being sold. The Blessing Buddha is currently in the Hay House headquarters. I recommend this book for spiritually aware people or people who would like to become more so. If you are feeling down about yourself, this is a good book because it helps you to love yourself more. This is an abstract picture of the universe. It deals with textured acrylic paint and the idea of the universe being connected. 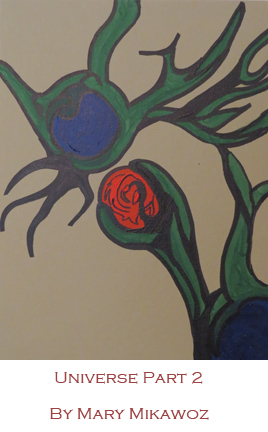 I am influenced in my abstract art by Jack Bush (a Canadian Artist) and Lawren Harris of the Canadian Group of Seven. For bigger image, click here.